White mountains, sunshine. A perfect winter’s day. I set off up into the Cairngorms staring across the shining new snow. The first real winter’s day. The snow had fallen two nights previously, the first night of December, coming on strong winds that had left it in drifts piled up against banks, rocks, tussocks. I soon found that although the snow cover looked thin, with stones and grasses poking through, in many places this was not the case and as the snow was soft and unconsolidated I broke through constantly. Walking was not easy but then in true winter conditions it shouldn’t be. I crossed the Cairngorm Plateau with no sound but the occasional rasp of a ptarmigan and the distant voices of a few climbers in the Northern Corries, which quickly faded away as I headed for Ben Macdui. The high lochans and streams were frozen, the rocks were glazed with ice and frost. The low sun gave a warm glow to the land but the air was cold. Visual warmth only. 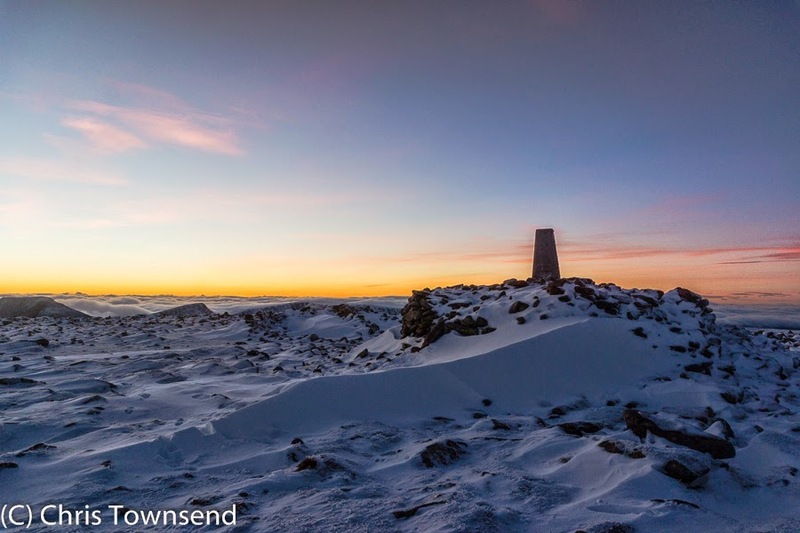 I reached the summit of Macdui just before sunset. To the south, west and north a blanket of cloud covered the hills with blue sky above it. The Northern Cairngorms seemed the only range shining in the last rays of the sun. Across the Lairig Ghru the peaks of Cairn Toul and Sgor an Lochain Uaine appeared to be holding back the rolling white cloud that covered the rolling uplands of the Moine Mhor. 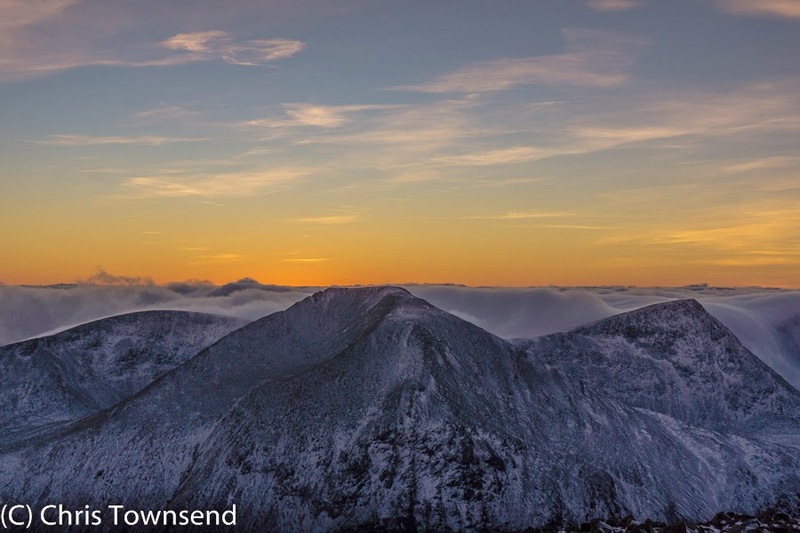 The sun sank below a shoulder of Cairn Toul and the warm glow was gone from the mountains. Only in the sky did colour remain as the hidden sun lit the clouds. To the east an almost full moon rose and the light changed, pale and cold rather than bright and warm. I stayed on the summit until the last pink tinge left the sky and the first stars were appearing. Then I headed down to Loch Etchachan. The moonlight was bright enough that I didn’t need a headlamp. 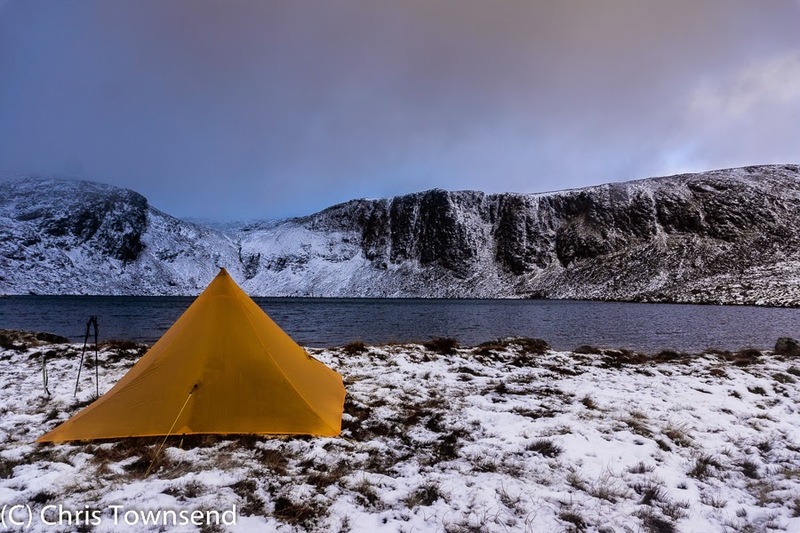 On the shores of the loch I pitched my tent and stared across the water to the cliffs of Carn Etchachan where the snow glowed in the moonlight. 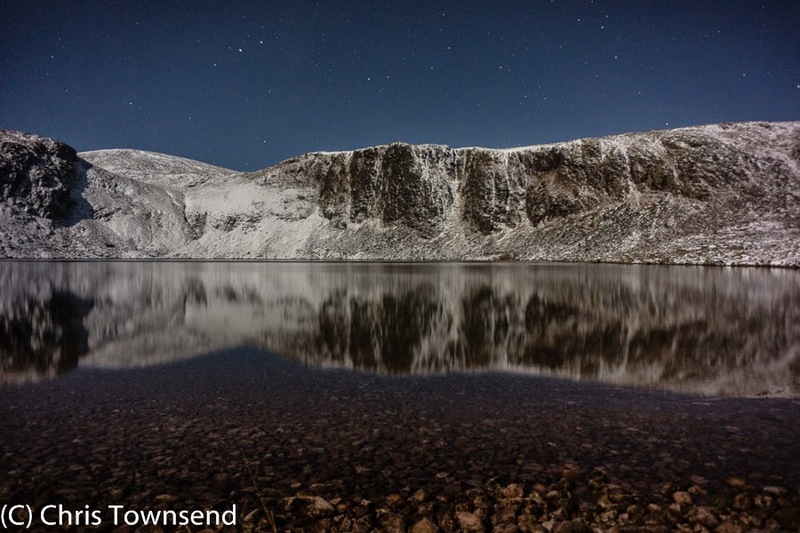 To the east below the moon bright sparks flashed on the surface of a small lochan as if there were stars in the water. These came and went as I moved about, creating a magical scene. Only the next morning did I see that the lochan was frozen and that the ice was cracked and broken. Tiny facets of it must have been catching and reflecting the moonlight. Frost appeared on the tent and ice in my water bottles. The air was crisp, cold and calm. Reluctantly I finally slid into my sleeping bag and fell asleep, with the moonlight shining in the open door. Sometime in the night a wind sprang up and blew cold air on my face, cold damp air. I looked out. Nothing. Thick mist surrounded the tent. I zipped the door closed and drifted back to sleep. By dawn the gusty wind was noisy, rattling the tent. The mist had risen, capping the peaks but leaving my camp clear. 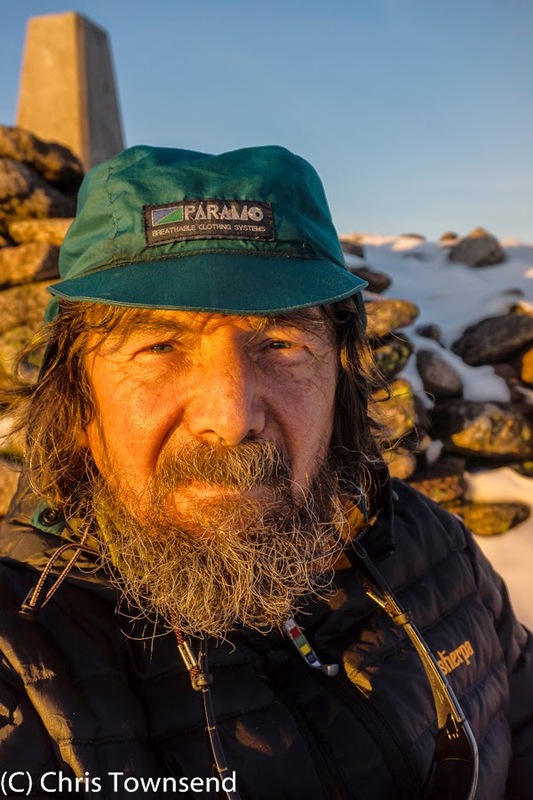 I returned over the Plateau in the opposite conditions to the day before, struggling in the strong wind that threatened to knock me over as I balanced across icy rocks. I was in dense mist most of the day too, using compass bearings to navigate my way. Snow was falling, thin hard flakes blasted by the wind. 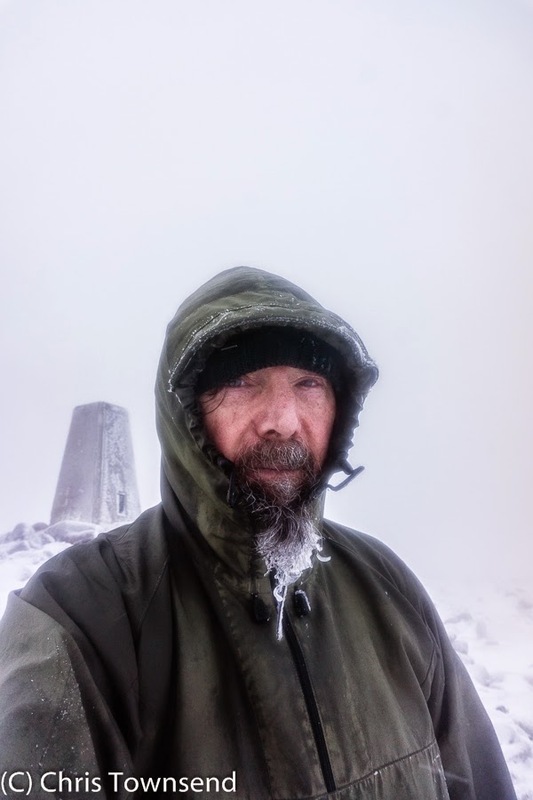 The summit of Ben Macdui, a good landmark to take bearings from, was hazy and more snow had piled up against the big cairn. Only when I dropped below the Plateau did I start to leave the mist and escape the wind. 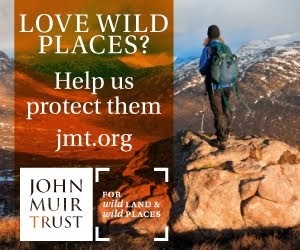 I've never hiked the Cairngorms yet, but your blogs, books and videos put me there every time I read or watch them. Magnificent. thank you Chris. Great pics, Chris. Can't wait to get back up there! Some really really nice photos, and a well written piece too! Fantastic! I appreciate the photos and story of a place I'll never visit. I found your blog on Twitter this morning and will spend more time reading and enjoying. Stunning photos Chris. Winter there is the time to see the mountains at their best. New MLD shelter ? and what bag did you take this trip? Shelter was Duomid XL. Very roomy for one! Bag was Salewa Fusion -8 with Primaloft Silver Insulation Down Blend. Overnight low was -3C and it kept me warm. 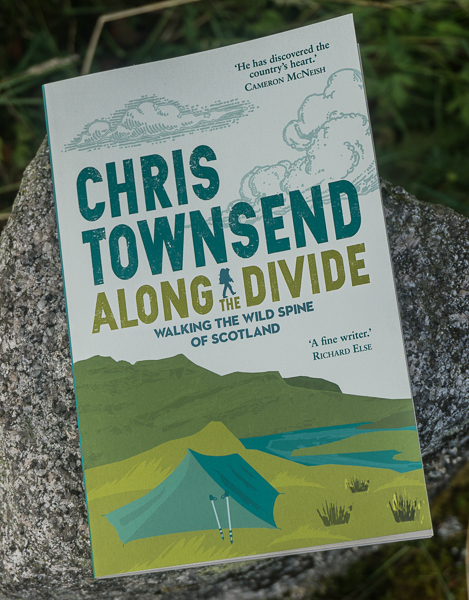 Really superb photographs Chris, and beautifully written. A real inspiration. Great article Chris. Agree with all comments above, especially Martin Rye... 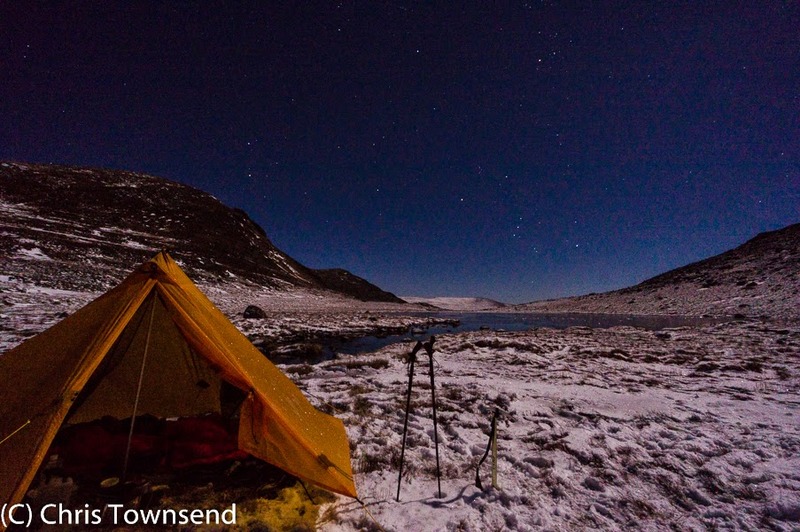 I too agree that the Cairngorms come into their own under snow and ice. Lovely photos... Long exposure on a tripod? Thanks Jay. Yes, long exposures on a tripod. 10-15 seconds. Thanks everyone. It was a great trip. Chris, going off topic slightly, but sticking with the photography aspect, you recommended the Sony d6000 camera to me. 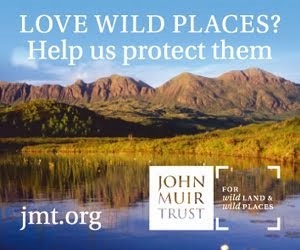 I like your photos (particularly the one of the tarn in the Lake District published in TGO recently) and my question is what lens would you recommend? I'd only want to carry one to save weight. The 16-50mm Jay. That's the one I use most. It's tiny and ultralight and the quality is fine. Glad you like that photo. It was taken on the 16-50 at 20mm. ISO 200, F8, 1/50. Handheld. Chris, what pole were you using to support the Duomid XL? Ian, I use the GoLite Shangri-La 3 pole, which worked well.